We began the travel preparations today with packing the check in bag for Brad and Emmie. This contains the “can’t find in England” stuff and some liquids. Today it contained another surprise -Gracie. Apparently she wants to head across the pond also. 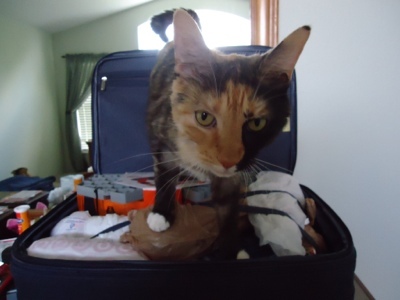 I’m not sure Delta would be too happy if we packed the cat; realistically she is the only one who could go with us, but I’m pretty sure trans-Atlantic travel with Gracie is not my idea of relaxing. And she would be in quarantine longer than we will be in England, so not such a good idea. Now to convince little miss Gracie of this. … I think she heard about the horses and decided Ren should not be the only one having fun. 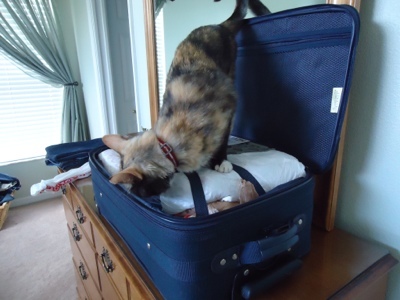 I love the first photo with the cat in the suitcase. She doesn’t look like she wants you to go anywhere! Thanks for stopping by my blog, by the way!